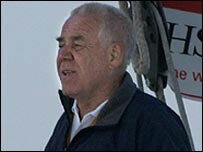 Yachtsman Tony Bullimore has made contact after 11 days of silence. Mr Bullimore, 67, from Bristol, had been sailing across the Indian Ocean when his catamaran's satellite phone went down on 7 November. The radio silence prompted coastguards to look for Mr Bullimore and his crew of three, who were heading to Australia ahead of a new round-the-world attempt. Mr Bullimore made contact with his wife on Saturday morning after coming close enough to land to get a mobile signal. It is believed he is a day and a half away from reaching Hobart in Tasmania. Shipping had been alerted to look out for Mr Bullimore's 102ft vessel after his team admitted they had no idea where he was. On Saturday he made a brief call to his wife, Lalel, before switching off his phone to conserve its limited battery power. Barry Pickthall, from the Team Bullimore control centre, said: " He spoke to his wife this morning at about 0630 GMT and said everything was fine. They have just not had a satellite phone line." Ten years ago Mr Bullimore was rescued from inside his capsized yacht in a remote corner of the Southern Ocean. The former Royal Marine won international fame after surviving on "sheer determination, a little water and a little chocolate" for five days in the upturned hull of his boat.